Welcome to the WeatherTech 2018 Le Mans Spotter Guide, the most up to date and detailed visual resource to follow the 2018 Le Mans 24 Hours. Created by Andy Blackmore Design, the Guide features all the information you need while following Le Mans, from the track or home. This version of the guide (v3) is final and last updated after qualifying. Thanks to our partner, WeatherTech , without whose support this unofficial guide wouldn’t be possible. NOTE: PLEASE LINK TO THIS PAGE, not the PDF as the filename will change (and its also harder to capture download numbers. As with previous years, the guide features all the information you need. From Chassis details to driver grading and Pit garage allocation and for 2017, the three main social media addresses for each team, everything is covered making this the one resource to have at your fingertips. 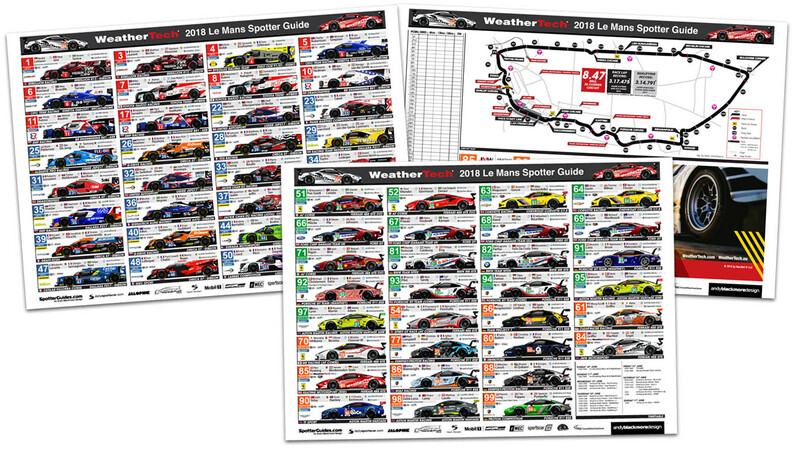 If you like the Spotter Guide series and find it useful, I would appreciate it if you follow WeatherTech or WeatherTech Racing as a Thank you on Twitter. Special thanks to my proof reading team of Shea Adam, Paul Marquardt, Marcel ten Caat, and Michael Zalavari. They did an awesome job going through the guide in detail. Thanks to DSC’s David Lord, Peter May and Graham Goodwin, and also to Adam Prescott for assisting with reference. Thanks to the majority of teams who also helped with the guide. Thanks to all the media who continue to support and promote the guides. v3 – June 15th #11 SMP now has a yellow rectangle on nose. Small livery updates following Qualifying. Grid positions added.